Researchers are one step closer to creating a micro-aircraft that flies with the manoeuvrability and energy efficiency of an insect after decoding the aerodynamic secrets of insect flight. The breakthrough result, published in the journal Science, means engineers understand for the first time the aerodynamic secrets of one of Nature's most efficient flyers – information vital to the creation of miniature robot flyers for use in situations such as search and rescue, military applications and inspecting hazardous environments. "The so-called `bumblebee paradox' claiming that insects defy the laws of aerodynamics, is dead. 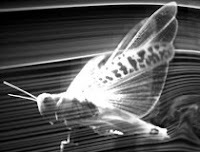 Modern aerodynamics really can accurately model insect flight," said Dr Young, a lecturer in the School of Aerospace, Civil and Mechanical Engineering at the Australian Defence Force Academy (UNSW@ADFA). "Until very recently it hasn't been possible to measure the actual shape of an insect's wings in flight – partly because their wings flap so fast, and partly because their shape is so complicated.